Thursday April 4, 2019-Maragua MP, Mary Waithira,has asked nominated MP, Maina Kamanda to retire from politics claiming that he is too old to perform the job of a legislator. 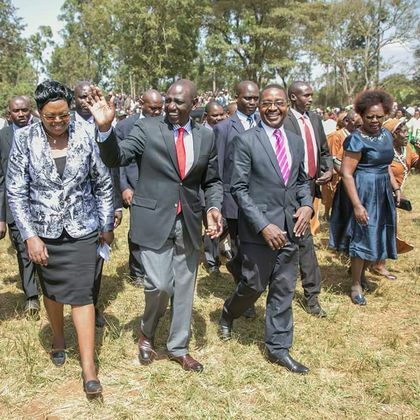 Speaking during a fundraiser in Kamahuha Girls attended by Deputy President William Ruto on Wednesday, Waithira said Kamanda is too old to be in politics and he should go home and he should handle his mantle to young generations. “Mr Kamanda should retire from politics and let new blood reign while he takes times with his great-grandchildren," Waithira said. Maina Kamanda is among a group of Mt Kenya leaders who are opposed to Deputy President William Ruto’s presidential bid in 2022. "There are people who have teamed up with the opposition and formed a movement called ''Stop Ruto''. They should know that Kenyans will gauge them based on development projects and not by joining a group of confused busybodies who are out to split our party," Ruto said.